Has self-expression become too risky? Maybe that's why there's an urge lately for clothes that allow the wearer to go unnoticed. Putting up a disapproving graffito in the urban environment can land you in jail, and think twice before criticizing any religion because it can cost you your life. 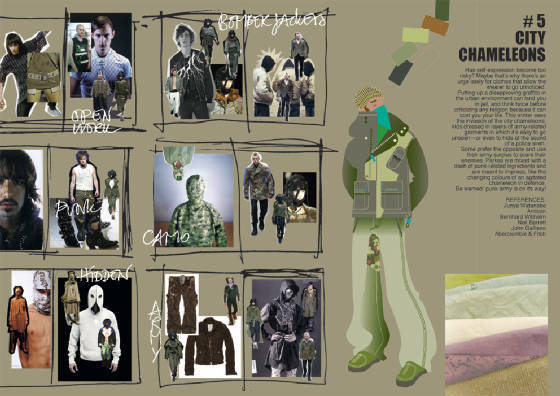 This winter sees the invasion of the city chameleons: kids dressed in layers of army-related garments in which it's easy to go unseen- or even to hide at the sound of a police siren. Some prefer the opposite and use their army surplus to scare their enemies. Parkas are mixed with a dash of punk-related ingredients and are meant to impress, like the changing colours of an agitated chameleon in defence. Be warned: punk army is on its way!